I have received permission to use pictures for Bonnie Bride, when her display came up for auction. This page is for you that need to verify the names or the information for this doll. Of course I have a couple of these dolls standing around, but this display is really unique. 1964 BONNIE BRIDE doll which has never been removed from the STORE DISPLAY box. She is from DeLuxe Reading Corp., Elizabeth, NJ. Here are some quotes from the Store Display box: Bonnie Bride with the most beautiful bridal gown in the world; Press one button Bonnie throws her bouquet; Press another button Bonnie goes to you; Supply limited place deposit now. Please do not deliver this display or any other deluxe toy display item until Christmas; All displays should be sold for delivery December 24th. The best I can tell Bonnie is about a 21" doll. She is on a wheeled platform, and that's how she "goes to you". Inspection certificate and instructions are still attached to the side of box. It is apparent that Bonnie has never been removed from box. 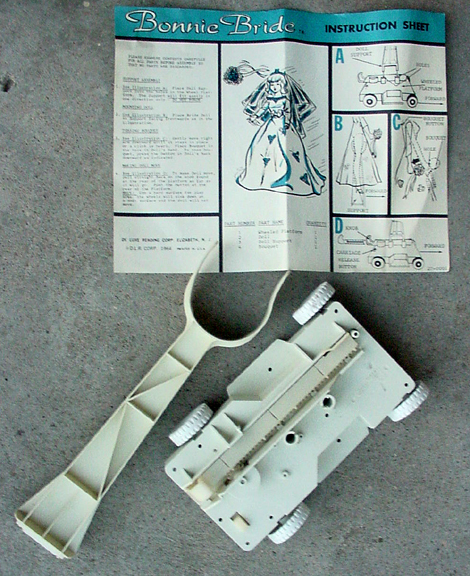 This doll also comes in the original outer shipping box from DeLuxe Reading Corp. This box is rough in areas and has water stains at one end. It is being used because it is the original shipping box. One side of the shipping box says, "1 Pc No. 27K Starter Bonnie Bride Doll". This is probably what your Bonnie Bride box looked like. Not many young ladies got the display models. The instructions, I'm not able to read, thanks to Jan for lending me her excellent pictures. My box has had tape on it and when it was removed, it removed the picture on the box also. That instruction sheet is the only thing that I am missing off my doll.